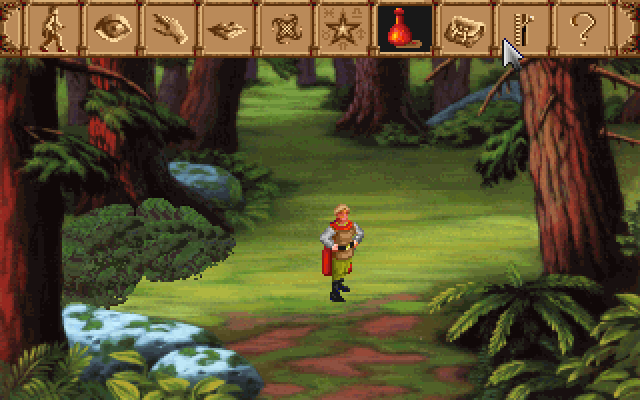 Ever since I finished playing the Quest for Glory series again, I’ve been trying to pick up another good adventure game that I can enjoy as much. Gabriel Knight seemed like a good choice (also available via GOG.com, by the way) and I already had it from a previous GOG purchase. When I last left off…well, last left off before I started playing again yesterday, I was in the middle of day 2 and obviously flagging. I don’t know what it is about this game. It’s gorgeous, and the story is interesting, I like the characters, and you’d think that the only thing required to make me adore it is that there is a scene wherein Tim Curry denies himself entry to a rich people house and tricks himself into letting himself in. I love voice acting so much. But the puzzles are not as intuitive as other games I have played. They’re not as bad as the yeti pie thing, but… I don’t know. Using a coupon to get a hot dog and then using that to bribe a little boy to squeeze through a fence to get a piece of paper so that you can then… Ugh. I do like the sequence of puzzle events, but it’s nearly soup cans. I spent five minutes looking through my inventory for something that I could use to extend Gabriel’s dumb reach or just come at it from a different angle. I could have reached the stupid paper with a stick. QfG5 had bribe Cerberus with different kinds of food. I don’t remember if there were clues for that, thought. Maybe I just started giving him whatever and seized upon the idea of how one cannot get pizza delivered to the underworld. It’s hard to come up with puzzles, so I guess I shouldn’t be too fussy about that stuff. I usually figure it out eventually. My big problem is with the user interface. It’s been made worse by my recent playthrough of QfG, simply because that somehow has the smoother interface with the least amount of hang-ups. There are about four buttons meant to make your character interact with the environment. The use and function of each of these is immediately suggested by the shape of the icon. A man walking (later, footprints), a mouth, an eye, and a hand. In QfG 5, this was streamlined to just the eye and hand. Basically, this entire game was perfectly playable to the point that I barely noticed the functions in the interface, with only two major functions: use and look. It makes sense. The hand took over the single-use function of the walk icon, as well as the similarly one-dimensional talk function. Asking and telling were put into the same dialogue box. The eye went on doing its job, no change necessary. So why, oh why, did Gabriel Knight: Sins of the Fathers, released between Quest for Glory III and IV, need EIGHT functions? Obviously, I’m not counting the subsidiary toolbar functions, such as the help or menu buttons, the inventory (which both series needed) and the magic/stats/time of day things (which only QfG needed). Those are not things that you can access outside the toolbar, and both games handled them about the same way…although Gabriel Knight did add the “read” function to the inventory screen, but whatever. The dialogue recall worked, so I’ll leave that alone too. Those are not the most common things you’re going to be doing. Having to constantly drag the mouse up to the tool bar to choose the function you need rather than right-click cycling until you get the right one is time-consuming and annoying. But not as annoying as cycling and accidentally going past the walk icon four times in your quest to leave bloody Jackson Square. How difficult is it to see the tedious, underfoot redundancies? Bisecting dialogue into two separate functions in particular is far, far more annoying and honestly less intuitive than the QfG games that let you click the mouth on the hero to Tell About. Mostly because it adds to the long cycle through icons. The sad thing is that it looks like they were a bit aware of this. The EIGHT buttons in Sins of the Fathers are actually separated into two boxes, and the division appears to be based on either frequency of use (the look, walk, and redundantly bifurcated speech icons are in the leftmost box) or because the rightmost box is obviously just a quadsected single icon. Ugh. It makes playing this game so mechanically tedious. I’m more frustrated with cycling through EIGHT icons than I am with the puzzles or Gabriel’s accent. The interrogation mode is also badly designed, but I’m afraid that if I articulate exactly why, I will stop playing. Don’t be crazy, I say. Or should I? I really don’t know. Back when my friends and I wanted to seed our own tabletop role-playing group (my idea, but it was thanks in no small part to Spoony’s influence), we all decided rather naturally that I would be the one running any and all games. This did happen partially because I was the best at juggling things within my free time, and also because no one else really wanted to do it. In the end, I wound up running one session, and then we took advantage of Dither’s experience for a few other sessions. Since then, I sort of grew a phobia of GMing. I got shy, I guess. It’s hard to be the centre of anyone’s attention, and although I can be quick and witty, I can’t just call it up when I feel like it. I also had a couple of bad experiences with role-playing in general. Then, the other day, while I was playing Quest for Glory… either 2 or 4, Dither made a character sheet for a D&D version of my legacy wizard hero Schmendrick. This is the activity version of a leading question. The idea there was for us to play through a game at the table that covers the story of the Quest for Glory series. At least the first game. Which a certain someone other than me has never played and I don’t think had even seen at that point. We didn’t actually sit down to play for a couple of days, but when we did, I ended up loading the game so he could see how the hero first enters the town of Spielburg. Possibly I also corrected him or more likely clarified something he had gotten from research. I think I’m the one who offered to switch places. I know this game better than some books which I have read more times than I have completed this game. Ew, word salad. Hope it makes sense anyway. Anyway, I was already having fun. But when we switched places, I felt some kind of power. Not over anything, just general sort of power, I guess. I knew exactly who went where and did what. And I had a fluid enough knowledge of the game and its writing style that I could push him towards the information he needed to ask for, and also to shoehorn in stuff he needed to know based on who he was asking and what he’d asked. It’s nice to work with material with which I am inanely comfortable. …I think I just scared Pandora. I thumbed down like three tracks in a row, and it started playing only tracks that I had previously thumbs-upped. Talk about power. I just intimidated an internet radio. I must have really been stabbing down with the mouse button. Jab jab jabjabjabjab. Take that, thumbs down button, you most useful of the buttons on this UI. Or rather, daughter. This is a concept that I have been considering for forever. It always has the tagline “Son of Schmendrick” in my mind (at least, this iteration of the concept) even though I have always pictured a young girl. At different stages in life, generally before adulthood. Something I used to think about doing when I played QfG five a million times in a short period of time: writing an afterstory. One of the reasons that I never did that was because I just don’t have a mind geared for fan fiction. I think I tried to write it once and ended up with a completely original story. By accident. Venturing away from digression, it is part of this whole nostalgic fling to have that concept come up again. And now I have the perfect forum in which to indulge the ridiculous impulse. Of course, being that I have not magically changed from the last paragraph, this isn’t proper fan fiction. It’s about the daughter of a retired hero who is my concept of Schmendrick. No referenced events, places, or characters from the game. Fine line distinction? Yes. But an important one. Opulence did not suit the family of a hero. A year spent in harsh climes, experiencing nearly every kind of want had left the head of the family with very lean needs. But he did have one indulgence. His chair. It sat halfway between the fireplace and the window. The window was another expensive luxury, but his wife was the one who had insisted upon it. She would lean on the back of her husband’s chair, watching their children through the smooth glass panes. She clicked her tongue against her teeth and reached over to grip his shoulder. “Anstice has run off again,” she said softly. While the two of them slid into the old, comfortable argument of how appropriate some of Anstice’s lessons were, Anstice herself climbed a tree. It was a very old tree. Thick as an ogre and twice as tall, with lower branches that she could not wrap both arms around. Higher up, the branches were plentiful and thinner. Near the top, they were whippy enough to flick at her if she wasn’t careful. She straddled the highest branch that would hold her weight, careful not to let her dress bunch up or tear. Although her parents had suggested she wear britches, Anstice preferred the flow of a skirt. So long as she wore a pair of her little brother Dastan’s short pants under the skirt. A bit of aggressive fidgeting assured her that she had achieved a decently sturdy perch, she reached up and plucked the red alder wand from her hair. It fell away from its loose bun, settling about her shoulders like a yellow cloak. Anstice squinted at the wand. It was not as imposing as her father’s mighty oaken staff. But it still had a good heft. She could pretend it was a dagger. As she twirled it round to imitate a dagger, a spark popped from the tip. Jerking back, Anstice felt it drop from her hand. Her chest slammed against the branch as she launched forward, grabbing at the wand. Blue sparks crackled out of her fingers like lightning. They stretched, then shot away from her, flying after the wand. A foot off the ground, the wand was enveloped by the magic. Its own rich red colour spread throughout the blue ball, turning it purple. Still hugging the branch, arm outstretched to the ground, Anstice grunted in effort. The magic was harder to control without both feet on the ground. By the time she’d managed to pull the wand back within her physical reach, the mental exertion had begun to play on her body. She clasped the wand to her chest and leaned her back up against the tree trunk. Sweat matted her hair against her forehead and neck. Her breaths came in ragged pants. “Better practise that one some more,” she said to herself, tucking her hair behind her ear. It’s been a couple of weeks since I bought the full series pack on GOG.com, and I have managed to beat the first three. I beat the third one in about five hours, certainly in one day wherein I was doing plenty of other things. Which is kind of awesome. Although I think it has more than a little to do with the fact that the magic user is one of the most oppressed classes in the series, and that oppression is most palpable in Wages of War. Not one of the games allows you to cast magic casually about public places. In fact, they tend to forbid it by law or even fear and openly detest it. There is only one faction of people who openly reward you for being a magic user (Kreesha in the liontaur city does not count, as it is illegal to cast anywhere outside of her home), and your interaction with them is almost entirely made up of one-time events. So not really an actual location, since you cannot freely enter and exit it throughout any significant portion of the game. Thieves are universally disliked as well, but it seems less like prejudice and more like good sense. They steal stuff. This is not an ingratiating career choice. Other thieves like you because they have similar morals and are in a position to appreciate your roguish skill. In fact, they don’t always like you. But they get you. It’s a gang mentality, I guess. All of the classes offer a sort of in-group, but whereas the magic-user (and later, wizard) meets others of his ilk in generally isolated surroundings, the thief has a haven pretty much guaranteed to him in every game but four–although part of that is true for every character. Four is meant to be a lonely place for a hero. There is no real guild or group for anyone to take refuge in. No EOF for fighters, no mentor for paladins, no WIT for wizards, and no guild for thieves. At least, not in the way that there previously was. Fighters who did not go the paladin route are still left out, but then, it’s really, really easy to become a paladin, and no real reason not to do so. The paladin has one quest in particular that is a shining example of what he is and does, which I take as his alliance refuge. It is a “place” where he can be himself to the very peak of his heroic role. The magic user has a more familiar refuge, a peaceful place made by Erana, who despite never appearing, seems like a friend at this point. But people hate magic and wizards more than thieves. Thieves still have a guild, of a poor sort, but oddly, this time round you will almost definitely feel bad for breaking and entering about town. Anywho. I’ve been holding back on burning through Shadows of Darkness for two reasons. One, it was one of my favourites, and I want to savour it. Two, I started playing it with my husband, and so I want him to see as much of the game as possible. But on the other hand, I want him to see all of it pretty quickly, so that we can get to Dragon Fire and I can write about the children of my hero without spoiling anything. Now that is something I want to blog about today. :D I’ve got about three or four things planned, but my wrists and arm are kind of sore, so I don’t know how much I will actually do. As someone might have noticed, I have been trying to fill out my post count for May. Maths say that I can get 31 posts, one for each day in the month, if I write three or four posts a day up to the end of the month. Does that sound better or worse than a maximum of one or two a day? I beat Quest for Glory 1 in about two days. Schmendrick managed to get 496 points out of 500 (I think, now I’ve forgotten), because I forgot to buy Abdulla Doo dinner. Silly me. So that same day I beat it, I imported him into AGD’s Quest for Glory 2–which is just stunning. Thanks to the point and click dialogue system, I’m finding topics and dialogue options that I always missed in playing the original game. For example, I honestly never knew that Keapon Laffin offered his own magic-y game that’s even more ridiculous than the Mage’s Maze. I might go on pretending that I don’t know about it. Biggest problem with importing a hero is that while there are advantages–most easily recognised in your character’s starting funds–there are some disadvantages if you didn’t train your hero’s bum off in the first game. Poor Schmendrick was the victim of an unintentional speed run. This means that not only is he a piss-poor fighter, but that in spite of having acquired every spell in the first game, his magic stats are not as stellar as they might have been. After trundling about the desert for a while, and generally getting very fed up with Schmendrink’s inability to cope with this more difficult world and the fact that I never liked 2 as much as any of the other games (and therefore do not remember all of the puzzles and geography)… I went back to my last save before beating the first game and started training Schmendrick up. Each stat has a cap of 100 in the first game, 200 in the second, and so on throughout the series. So far I have his Vitality stat maxed out and every skill except for Intelligence, Strength, and Magic at or above 80. I think I might go ahead and give him a shot in 2 after getting his Magic and Intelligence past 80, but if I get in a mood, I might max him out in a rage of monster smashing. I also want to see if all of this monster-hunting-related wealth-gathering (oh the hyphens!) will impact his starting Trial By Fire funds. If I recall correctly, even with an imported hero, only the golds really transferred. Silver got left behind. And since he has accumulated about 480 silver pieces, the equivalent of 48 gold, I think I’ll be a little pissed if he only gets the routine amount, or if there is a fixed amount upon import. A set bonus, if you will. All of this makes me want to keep a hero journal, but I don’t think that would interest anyone. Maybe I’ll make one with a bunch of original content when I finish the series. I used to do that all the time. Writing the adventures of the Hero’s descendants. Going to try to get my hair cut today. So far, I have not had much luck with it, as odd as that is. Yesterday I had a grievous migraine that had me sobbing from the pain. I went to bed early and woke up around two in the morning, when I found an SMS from my brother, about THIS. I had to go back to bed to stop myself from buying them and playing immediately. Quest for Glory was my favourite game series, and to this day, I don’t think there has been a single successful attempt to top it. Not even Assassin’s Creed, which I went fairly nuts over until it was hit by the shockingly NaNoWriMo problem of character show-stealing. The first game has the title, “So You Want to Be a Hero”, which is a phrase that I have always loved. Quite appropriately, you play a young man who had a positive response to the question, and has recently graduated from a correspondence school for young adventurers. There are three classes, which later expanded to four, sort of. I don’t remember now if you ever got to actually create a paladin, or if you had to become one properly through the second game. Over the course of about nine years. It’s an amazing experience to play all five of the games with the same hero. What you do actually affects the story, in a way that games like Fallout 3 have overthought and largely failed to do. Even when those things are part of linear plot development, you feel accomplished and satisfied that you have affected the game world. 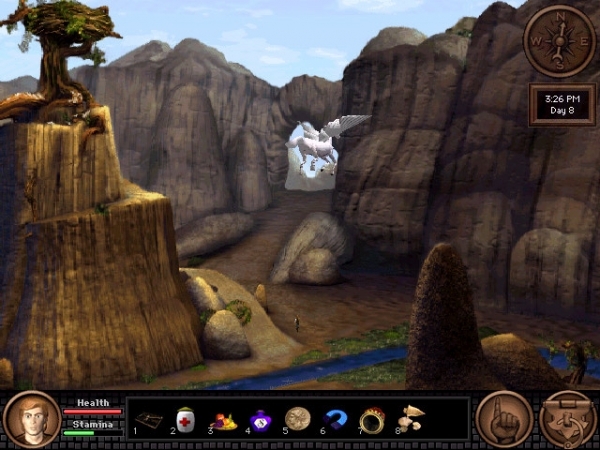 Each of the games has a clear influence from different cultures and mythology. My favourites are still the fourth and fifth, thanks to the Slavic and Greco-Mediterranean themes (and the in-universe version of the Cthulhu mythos). This is really just an excuse to gush mildly and come up with a post to fill out my horrendously dry month. Right now, I’m playing the VGA version of QFG 1, with a wizard named Schmendrick. It is midday on Day 2, and he’s just killed a goblin on his way to Erana’s Peace. He is feeling mighty proud of himself, but he’ll get obliterated if he runs into a brigand before he can learn an aggressive spell more affective than Zap (which only charges his weapon, it’s not Zio or anything). Just in case someone is reading this and actually recognises this series–the GOG bundle contains the VGA version of 1, the EGA version of 2, and I have yet to test the well-known bugs in the former and QFG 4 (whose bugs are INFAMOUS). I intend to play AGD‘s VGA version of QFG 2 rather than the EGA. Mostly because I was following it throughout its development and have as many fan-points invested there as in the original series. And because it features the hero import/export stuff that will make my journey from 1 to 5 seamless and AWESOME. Seriously though, go buy this series. It’s $10. That’s less than I paid for the Anthology ten years ago.